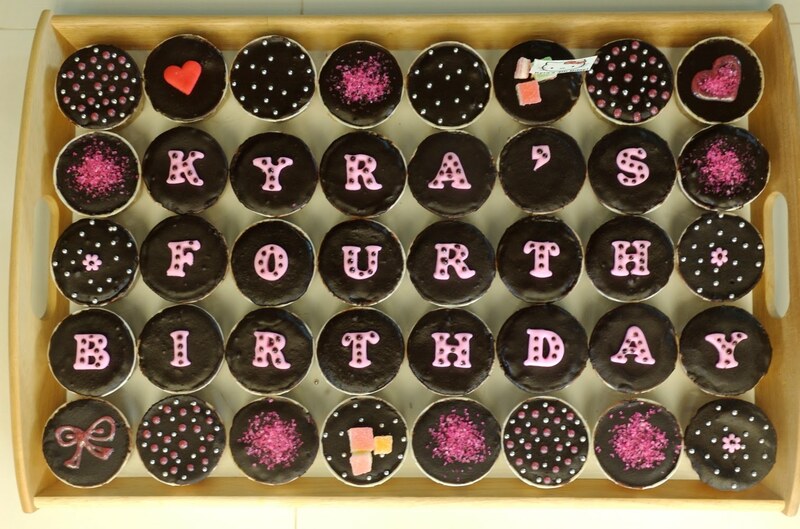 FOURTY, yes, 4.0. birthday cupcakes decorated in PINK coz Kyra requested for PINK HELLO KITTY theme! 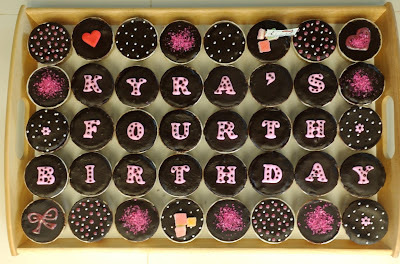 There's PINK GEL, PINK SUGAR, PINK FONDANT ALPHABETS, PINK CANDIES on top of the chocolate ganache here!!! 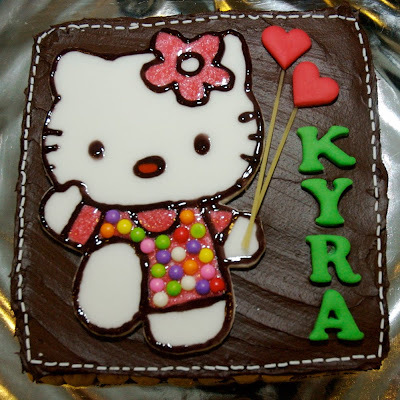 Yumm....my!!!! And the MAIN BIRTHDAY CAKE! 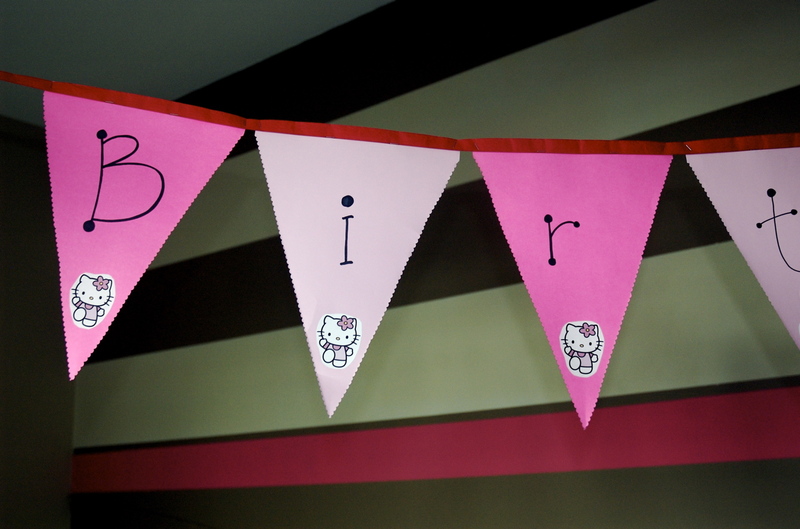 A Hello Kitty who wore pink polkadot jumper and pink flower on her head! Holding red heart-shaped balloons, which is actually the exact balloon shape that we used for her party really.....coincidence! 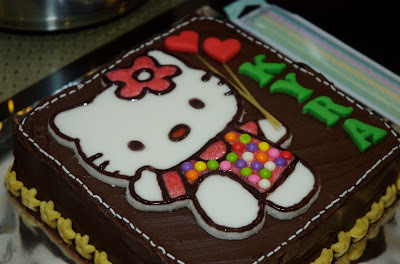 And here's the recipes for the cake + chocolate frosting! 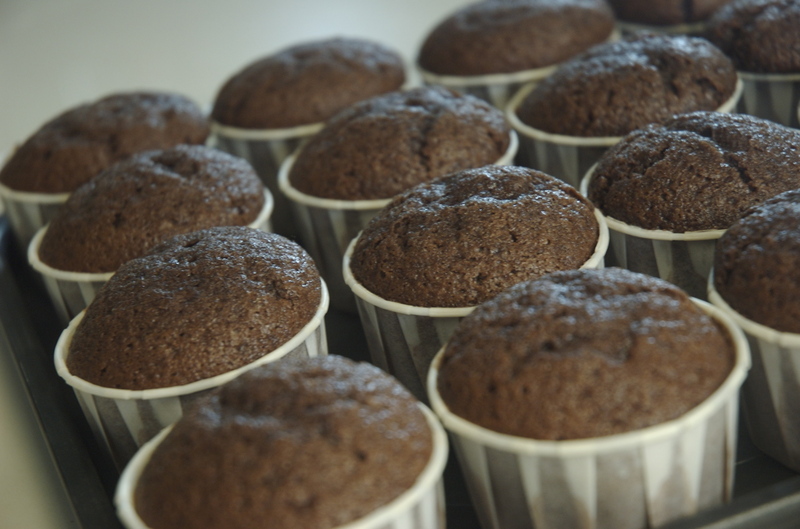 and I won't forget to add that it's very delicious...so you should try this recipe some day! And this is US. Too bad we didn't have more snapshots! 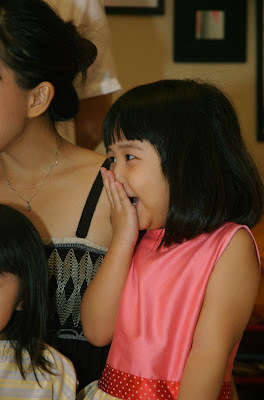 But the bday girl was very happy that night.....VERY VERY happy.....even my Godma noticed! SEE? She's thrilled...in fact, even before the day of the party actually!!! This is birthday babe with her fave aunt (sis#2) and all the presents she got! You see how matchy matchy the presents are???? It's as though they knew her mummy's makin her a play kitchen and they coordinated! 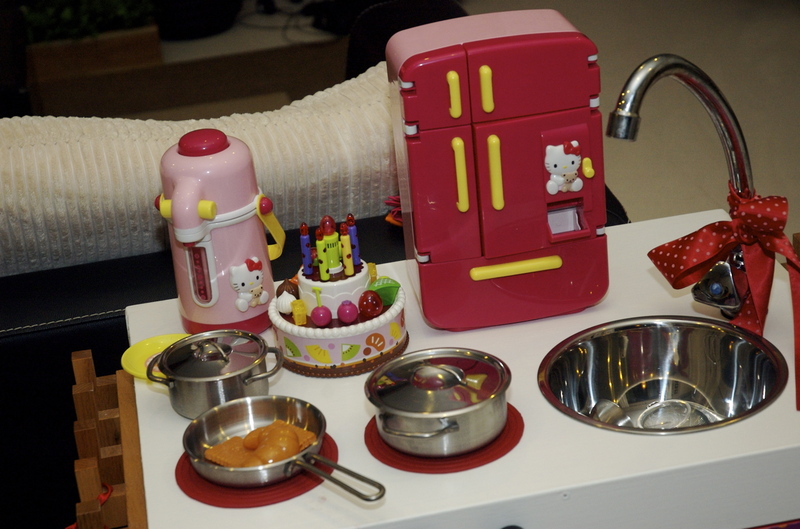 Water pot, fridge, bday cake, stainless steel pots n pan.....perfect for her new kitchen! The ultra inexpensive birthday banner in PINKs and HELLO KITTY.....something simpler coz I was really rushing her birthday present the past few days before the party by the way...(the kitchen). Their fave aunt came and they 'officiated' all the presents! Oh dear! Kyra looked like a butcher in the market in this shot! HEHE! 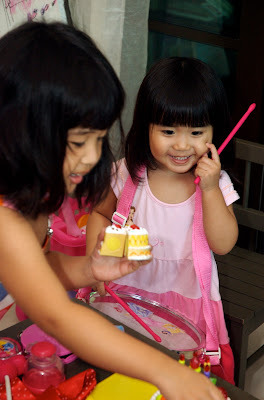 The red piece is a play apron I made for them, each babe has one. Little sis just lovesssss the drum super duper much! 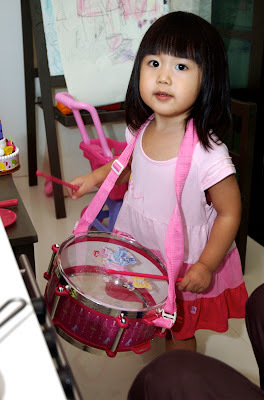 Isn't she a cute little drummer girl in pink here!? She's pink from dress to drum, gosh! 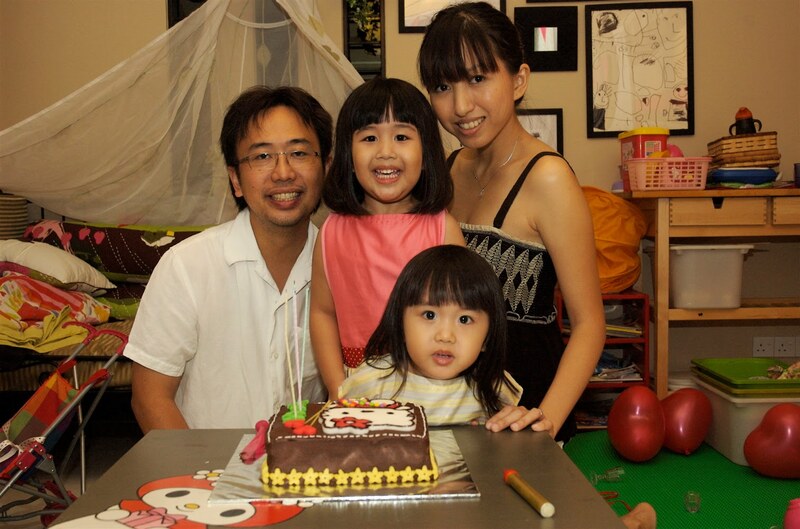 All I can say is, a smaller intimate birthday party like this is wayyyyy better than a big grand one. I get to enjoy every single minute without having to worry if I left out a guest on the deck or something........and things are more casual and fun too! Even the birthday babe approved!!! and hope that you'll always be in the pink of health! And you truly are a great and understanding kid! 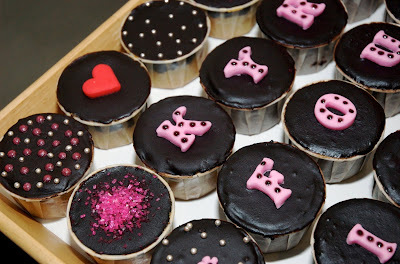 Hi there, wanted to try the choc cupcake + ganache recipe but don't know which recipe to click on? Was that under " Choc recipes" with the title choc cupcake at your given website add? the recipes for chocolate cupcake and choc ganache is found at www.wilton.com. 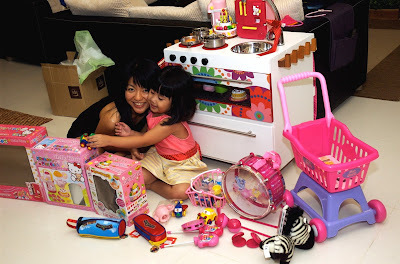 You're NOT an Ordinary Stay-at-Home Mum! How lucky to have a mum who can both Sew and Bake! I've been to sewing classes before but I've returned everything I learnt to my teacher until I saw your masterpieces which makes me feel like joining the class again! Hey, where did you learn your skill from? 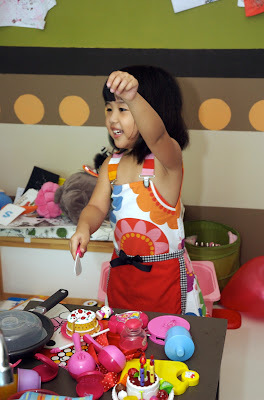 Besides, are those fondant recipe from wilton as well? The only lessons in sewing I got was during secondary school Living Skills class....but those are merely super basic ones....like how to get ur sewing machine running....how to sew a super simple ultra plain apron (that's the max), but I know I love sewing since I was 9 or 10!